Valéria Csépe, DSc, Csc, received her doctoral degree in 1981 from the ELTE Faculty of Humanities in Budapest. Since 2005 she has been a Professor of cognitive psychology and from 2005-2008 she was the head of the department and founded the Department of Cognitive Psychology PhD Program at the Faculty of Education and Psychology, Eötvös Loránd University, Budapest. As of 2007 she is a corresponding member of the Hungarian Academy of Sciences and from 2013 she is a member of the Academia Europaea. During 2008 – 2014, Csépe was Deputy Secretary General of the Hungarian Academy of Sciences (HAS). 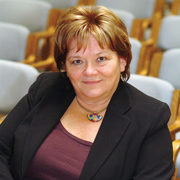 Currently, she is head of the research group and research professor at Brain Imaging Centre (BIC) at the Research Centre for Natural Sciences (Hungarian Academy of Sciences), professor of cognitive science at the Budapest University of Technology and Economics, as well as professor of cognitive psychology and psycholinguistics at the Institute of Hungarian and Applied Linguistics, Pannonia University,Veszprém. She has been on the Advisory Board of the Center for Applied Neuroscience since April 2016. Main research topics: neurocognitive development of language, brain correlates of speech, music, reading and their interaction, brain dynamics of multilingual performance, interaction of domain general (executive functions) and domain specific (language especially) processes.